Email signatures are simply an adaptation of the signature block of a letter. It declares who the email message is from and the institution the sender represents. 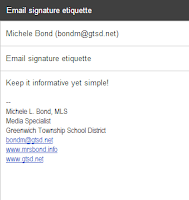 A signature file is automatically appended to the bottom of every outgoing email message. Log in to your GTSD Google Mail account. Click the Gear, found below your user name on the right side of the screen. On the General tab, scroll down to find the options for Signature. There is some debate over whether or not to include an email address. While mail between individuals will show your address in the "From" field, messages send to groups will not always show your address. Again, keep if professional. Simple is best. Your signature should not detract from the message. Avoid multicolored text, images, large font sizes, and overly ornate text styles.